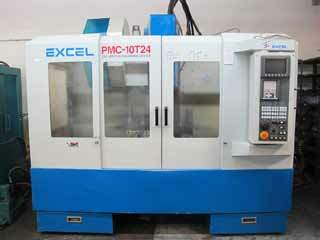 2000 EXCEL PMC-10T24, CNC VMC, WITH FANUC 21-M CONTROL, 40 x 20 x 20 (XYZ) BT-40, 23 ATC, 8000 RPM. 800 mm X 440 X 485 mm (XYZ). 1996 FEMCO DURGA 25E CNC LATHE WITH FANUC OT CONTROL, 23 TOOL DURGA TURRET, CHIP CONVEYOR 8” CHUCK. 1995 FEMCO DURGA 25E CNC LATHE WITH FANUC OT CONTROL, 23 TOOL DURGA TURRET, CHIP CONVEYOR, 8” CHUCK. 1986 NAKAMURA-TOME SLANT 1 CNC TURNING CENTER, WITH FANUC 11T CONTROL, 12 POSITION TURRET, TAIL STOCK, 8” CHUCK, S/N: 24606. 1995 ADVANCED VMC-500P CNC VMC, 40 TAPER, 16 ATC, MITSUBISHI CONTROL, 6000 RPM, S/N 950657-1622. 2011 MITUTOYO PH-A14 OPTICAL COMPARATOR WITH KA COUNTER DRO, S/N 5011109. 208 ATLAS COPCO GX7-FF, 10 HP ROTARY SCREW COMPRESSOR. ACRA TURN GH 1440A, 14 x 40 ENGINE LATHE WITH GAP. MAXMILL VERTICAL MILL WITH NEWALL DRO, AND POWER FEED TABLE. KURT VISES, BT-40 TOOL HOLDERS, CUTTING TOOLS, CHUCKS, HOLDERS.